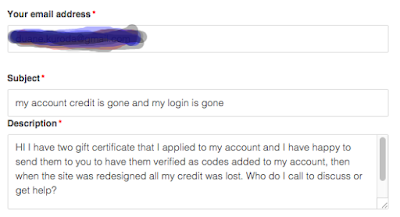 Executive View from Silicon Valley: Oh Maker Shed, why do you mock me and steal my account credit? Oh Maker Shed, why do you mock me and steal my account credit? I've been a subscriber to Make Magazine and even asked my family to send me gift certificates to buy items there. As such, I opted-in to their newsletter and patiently scoured each newsletter like a kid looking at a candy store, imagining the fun I would have when I purchased something on MakerShet. Finally, I found something that I wanted to spend my money on, but when I went to login in and make my purchase, Maker told me that my account didn't exist or have the funds I deposited. I tried to contact them and even send screen shots of parts of my Gift Certificates. My requests have simply been ignored, and I don't know why. I've screen captured part of my follow up message after my first one was ignored. They haven't lost my email, since they still send a newsletter to me, but their recover password system tells me I don't have an account. Even thought I've sent them evidence of my account, they choose not to respond. All I can do is keep posting on social media until someone notices or until I take other steps that will incur costs and times to recover the small, but meaningful value of the gift certificates that were were provided to me as gifts. Any bets on how long it will take them to respond or resolve the problem? My first message was a week ago or so, and I just send another reminder today, Feb 5, 2016. I'll keep a tally and track how long they ignore me and provide horrible customer service.